Have you heard about the Process Pledge? I, Sandi, pledge to talk more about my processes, even when I can’t quite put them in the in words or be sure I’m being totally clear. I’m going to put my thinking and my gut feelings out there. 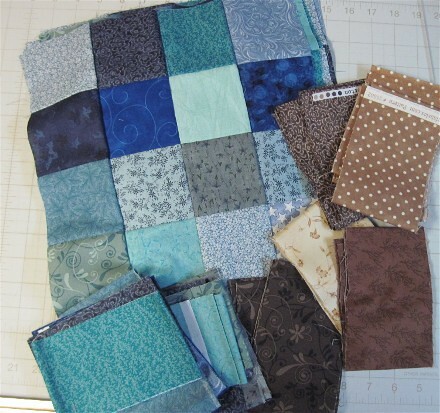 r0ssie, group owner of the Fresh Modern Quilts pool on Flickr and an amazing blogger, has pledged to post more about the process of quilting instead of just the finished quilts. She’s invited us to join her. She makes some interesting points about the definition of modern quilting and how quilt bloggers can grow (and help others grow) by thinking about and posting about the process behind their quilts. Check out her Mutant Quilting post, where she spills her thoughts. I am using these same fabrics for my Family Basket BOM, but that’s another post. 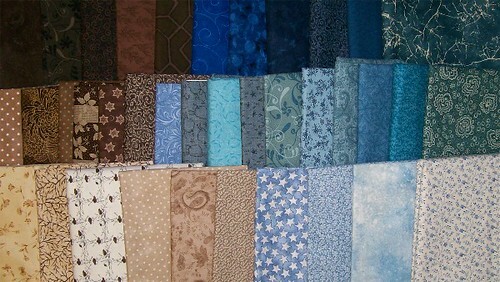 Whenever I choose a new fabric for the BOM, I cut two 3″ strips for Ryan’s quilt. I sewed some of the blue strips together in four different sets of four, then sub-cut them into 3″ strips. One of each set got sewn together to form the block. I will do the same with the brown strips and more of the blues. I’m a little annoyed at my lack of attention during the blue strips because I repeated a couple of fabrics in the blocks. I’ve decided to let it go, because no one but me will really care. Do you have trouble letting stuff like this go, too? 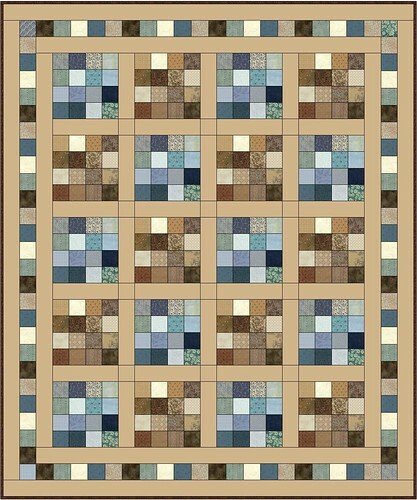 I think this is going to be a fabulous and masculine quilt!! looks perfect for a young man! I really like the simple method of putting this pattern together, and the fact that it’ll look completely unique each time it’s made by simply changing the color way. Now, you’re the Spring Bingo blog of the day! I love how you’ve grouped the colours together. Blues and browns are my favourites. Hi, just hopped over from bingo to say hi. I love your blog and enjoyed reading the entry about committing to write about the quilting process. I love the colors you’re using….those blues and tans/browns go together so nicely. I came by to say hello from SPRING FEVER!! I enjoyed what was said about writing about the process behind quilts. I was just involved with our patchwork group in making a Centenary Quilt for our town. I kept a journal for it and with everyone else, to write in it the decision process, what we did and where etc etc. It will then be put in with the historical records in the local library, the same precinct where the quilt will hang. Continue to enjoy your “creative fun”! !